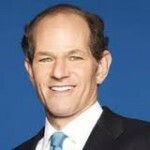 Eliot Laurence Spitzer is an American lawyer, political commentator, and former Democratic Party politician. Currently, he is the host of Viewpoint with Eliot Spitzer, a nightly news and commentary program on Current TV. Prior to that, he was the co-host of In the Arena, a talk-show and punditry forum broadcast on CNN from October 2010 to July 2011. He served as the 54th Governor of New York. Prior to being elected governor, Spitzer served as New York State Attorney General. After graduating from Princeton University’s Woodrow Wilson School of Public & International Affairs, Eliot Spitzer went to Harvard Law School where he worked for Professor Alan Dershowitz and served as Editor of the Harvard Law Review. After law school, Spitzer clerked for U.S. District Judge Robert W. Sweet, worked for two law firms, and then spent six years in the Manhattan District Attorney’s Office where he served as chief of the labor racketeering unit.